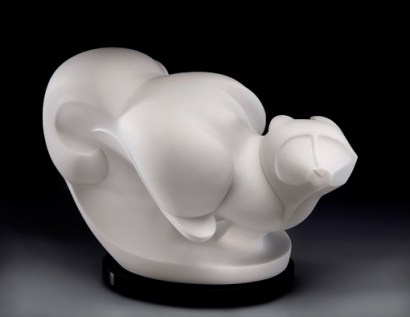 “Arctic Wind” is a stone sculpture inspired by the “winter whites” of the Arctic Fox, and by the way the wind sculpts snow. It is another manifestation of my fascination with the animals of winter. I love snow, and am awestruck by the soft curves and sharp edges of windswept drifts. Carving white marble reminds me so much of snow—sparkling crystal and the play of light on white forms remind me of skiing, my favorite winter activity. I show both views of this stone sculpture so you can see the soft and sharp forms; the way curves and edges bend and break light—my interpretation of the wind as sculptor. Arctic Wind side view. Photo by Mel Schockner. -The Arctic Fox wears a thin brown coat during the short Arctic summer, then changes to a pure white coat that is 200% thicker in the winter. -This extremely fluffy coat is the warmest of all Arctic mammals, the best at retaining heat. The Arctic Fox does not hibernate, so insulation is the key to its survival. -Though its ears are small to lessen the chance of freezing, the Arctic Fox has magnificent hearing and can pinpoint the location of prey (like lemmings) unseen under the snow. -The Arctic Fox aligns its pounce with the earth’s magnetic field. The fox pounces straight up and comes straight down on its hidden prey. It must pin the lemming down through the snow to catch it, since the fox does not have retractable claws. The pounce must be perfect to be successful. -Arctic foxes follow polar bears without cubs, and eat the meat the bears leave behind. The pose is the maximum storage of energy in a run, the “squash” in animation jargon. I love the shapes that combine to create this pose—repetitive rounds that combine to form head, chest, hips, and hind legs. I have carved it many times—One For All, Force of Nature, Run! Here, I use the stone in swirls and solids to accentuate the feeling of movement of soft, fluffy, thick fur. There is more to discover about this pose in many different animals—they all have unique aspects to their respective movements—different textures and degrees of squash and stretch. Different feels to their own way of moving. How exciting it is to the sculptor when one can capture that elusive quality! I do not entirely understand my reverence for the Arctic. It is special–a hugely significant part of the tapestry that is our world. The animals who live there are marvels of evolutionary adaptation, and I have carved very many of them. (Squash and Stretch, Phantom, Dancing on Thin Ice, White Lightning, The King of Winter, Big Feet.) My sculpture it is an expression of respect, a celebration of their ability to live where we cannot. I am not the only person who reveres this fragile no-man’s wonderland, and yet the Arctic melts. Scientific data documents the warming trend on earth, and shows the Arctic warming faster than anywhere else. I already mourn the potential loss of this astounding ecosystem. Perhaps we can change this from an inevitability by becoming stewards of the earth and ending our burning of fossil fuels. Sivec Marble, quarried in Macedonia for thousands of years, is one of my favorite carving stones. I finish the stone to 120-grit sandpaper; a very low grit that takes out the scratches left by the steel file but does not round the edges of the crystals, allowing them to sparkle like crazy. This finishing process requires a pristine finish with riffler, rasp, file and dry 60-grit sandpaper. Then the crystals pop to life when wet-sanding at 120-grit. I know . . . a bit technical, but completely exciting to a stone carver. 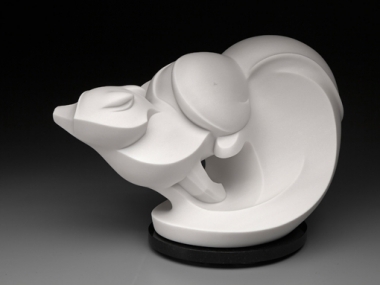 A sculpted snowdrift is an expression of the wind, and a white marble sculpture an expression of the sculptor. I equate the fleeting but powerful moments of artistic inspiration with the ever-shifting dance of the wind.